Episode #3 is finally a reality after allot of hard work and research. The episode covers our visit to the town of Atlanta, IL and the bunyan giant that lives there. Interestingly I learned more in post production then I did during the initial visit last summer. While editing I was able to get in touch with John Wiess and the information and video he was able to provide really filled out the episode nicely. 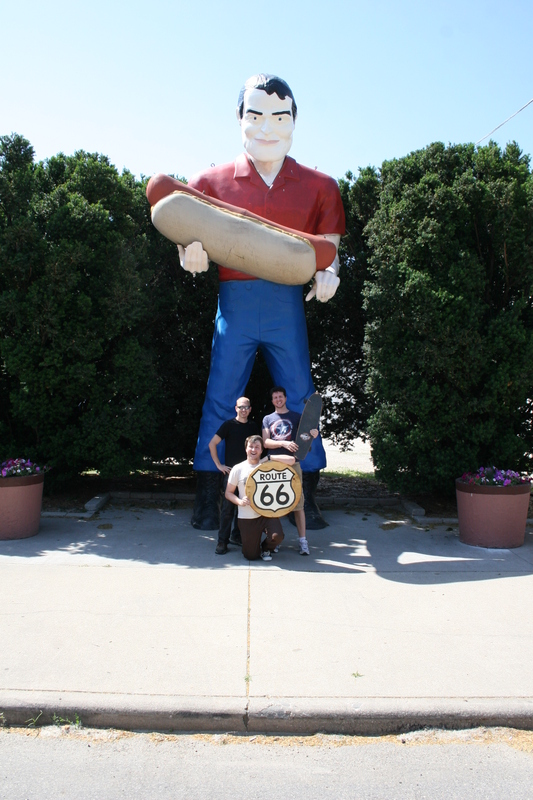 We want to thank him for his time and effort in helping us get this episode out as well as the Stephens family for their desire to help others continue the route 66 experience and for lending their giant to the town of Atlanta. I also want to thank Bill Thomas for the time he took to talk to our crew while we were in town and for all the work he has done to help the town. There are countless others who help out with keeping the giant repaired and painted, it really is a community effort. Although named “Tall Paul” during his move to Atlanta the giant is formally known as “The Bunyon’s Giant” This is to help us remember what he was for so many years while standing in Cicero. The reason for the interesting spelling is that Art Stephens didn’t want to run into any copyright issues so he named his restaurant “Bunyons”.